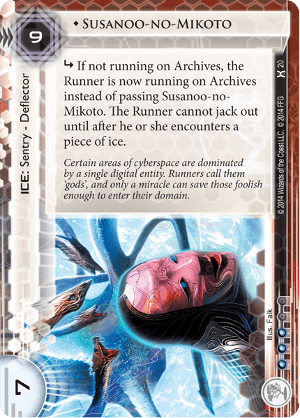 subroutine If not already running on Archives, the Runner is now running on Archives instead of passing Susanoo-no-Mikoto. The Runner cannot jack out until after he or she encounters a piece of ice. Certain areas of cyberspace are dominated by a single digital entity. Runners call them 'gods', and only a miracle can save those foolish enough to enter their domain. Susanoo-No-Mikoto is a hard sell for the corp. 9 to rez a piece of ice with only one subroutine? Why bother when Tollbooth, which costs 1 less, has more utility with a very taxing non-subroutine effect? The answer lies in what SNM is supposed to do. And I'm convinced this is there to do one thing—to flatline the runner. Jinteki may have more ambush assets than you can shake a stick at, but it's usually impossible to steer a runner into them. Most runners will just avoid an archives with several face-down cards, especially if they see a deck with little ice and laden with traps. SNM, however, can force them into the spider's web, but has to be used carefully to get the intended effect. The key to SNM is patience, along with its wording—"...until after he or she encounters a piece of ice." This means, if you have no rezzed ice on your archives, they must access archives! Or, you can drop some ice with net damage (e.g. Komainu, Cortex Lock, or even Neural Katana) with a nasty Whirlpool to ensnare runners without AI breakers. And, for the most part, SNM becomes more dangerous over time, as your archives fills up with Shock! or other ambush cards usable from archives. Lastly, putting an unrezzed Hokusai Grid on archives, or a House of Knives with counters available, provide other options for the final coup de grâce. Even if the surprise factor is lost, a 7 strength sentry is nothing to sneeze at if the runner doesn't have a Femme or a usable Switchblade handy. And, while I don't see ever having three copies of this in a deck (and not just because it's unique), it sure is fun to drop a single one in a Jinteki deck every now and then—it might just win you the game.